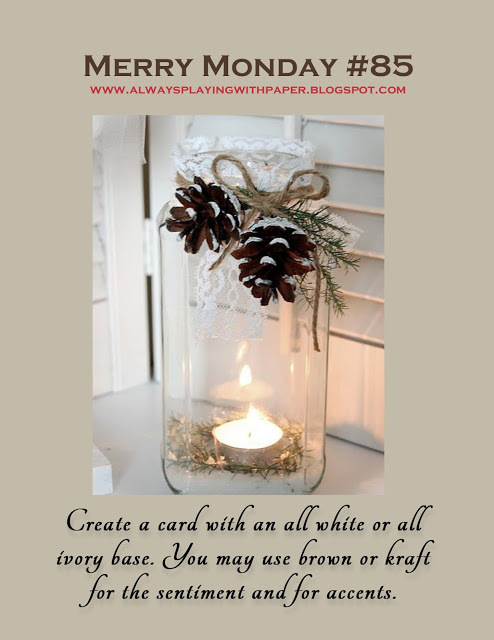 This week's challenge at Merry Monday is to create an all-white or all-ivory Christmas card. How can that not be classy and elegant??? 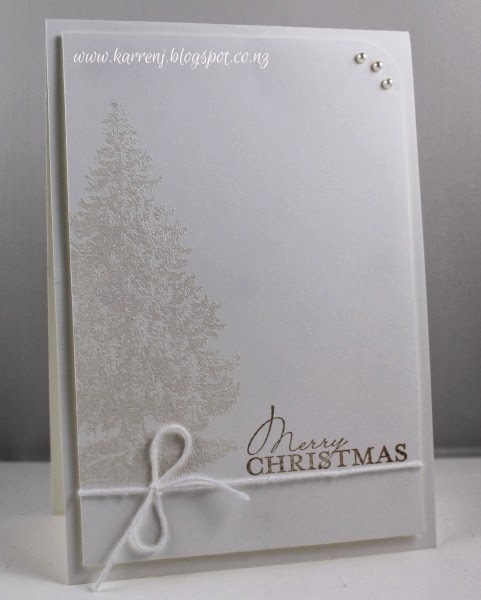 As soon as I saw the challenge details, I knew I wanted to do some white-on-white embossing and produce a very CAS but elegant card. This doesn't show up in the photo quite as nicely as in real life but I hope you get the idea. 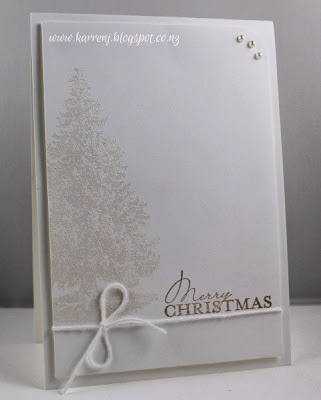 I white-embossed the tree from Christmas Lodge onto a panel of Whisper White cardstock. 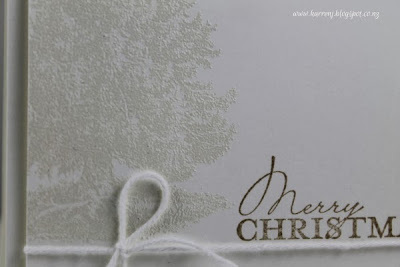 I then stamped the sentiment from Contempo Christmas in Crumb Cake ink. I rounded one corner and added some white Baker's Twine before adhering to the card base using dimensionals. 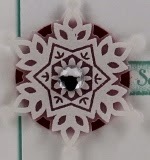 Here's a close up of the embossing. 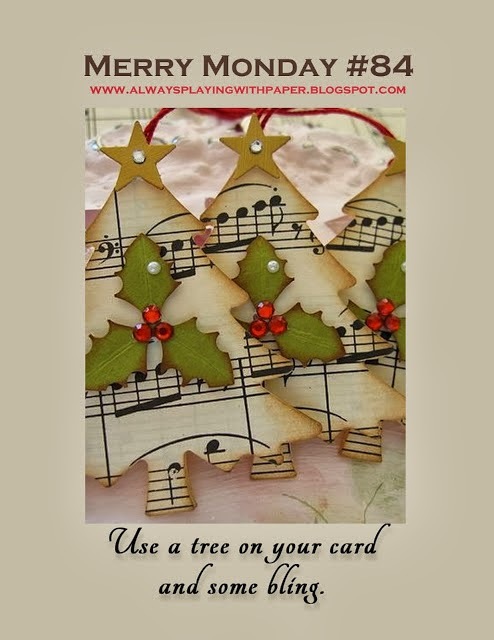 Check out the other DT cards and have a go at the challenge. I have spent much of today cleaning our house - a job I don't enjoy! We are having our first scoping meeting with the company who will be doing our earthquake repairs and they will be looking in every nook and cranny of our house to identify the damage, so it has to be spotless. Can I just say I hate washing skirting boards (baseboards) LOL! I did take some time out to make a card though. Today's card is for the color challenge at Color Throwdown and the sketch at Freshly Made Sketches. 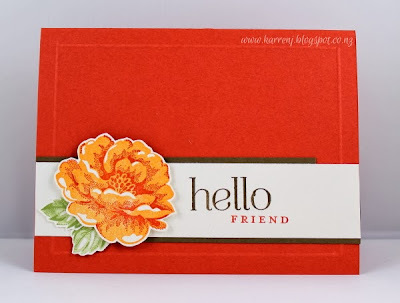 I used Stippled Blossoms for this card and stamped the rose in Peach Parfait and Dusty Durango. The sentiment was stamped in Soft Suede and Dusty Durango onto Very Vanilla. I added a bit of interest to the plain card base by scoring a frame using the cool technique shown by Brenda Quintana. My frame isn't 100% but it's a heck of a lot closer than previous attempts LOL. Edited to Add: This card got a mention at Color Throwdown. 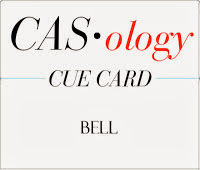 I had an unexpected day off work today due to a sick child, so in between playing card games and keeping him amused, I managed to crank out a CAS card. 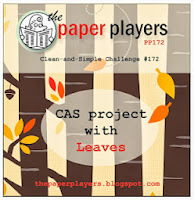 This card uses the sketch at CAS(e) This Sketch, the word challenge at CASology (Bell) and the Paper Players challenge to make a CAS card with leaves. This card didn't quite come out as I imagined but the general concept is there. 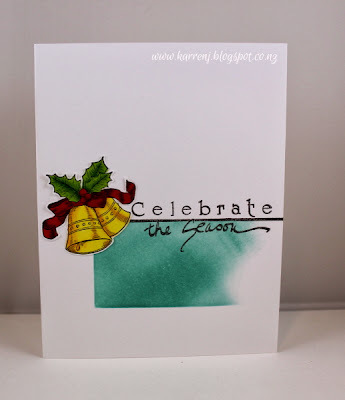 I stamped the bells from Bells & Boughs onto Neenah Solar White and colored with Copics. I have to say, that I must be doing something wrong, because the colors bled something awful which I've never had when I've colored onto Whisper White. On the card base, I masked a rectangle and sponged Pool Party ink, leaving the right hand side "unfinished". The sentiment is an old Printworks Australia stamp I have. Edited to Add: This card was named a Favorite at CAS(e) This Sketch. This week's challenge at Merry Monday is to use a tree and some bling on your card. Pretty simple, right? For my card, I chose the little tree in Warmth and Wonder and colored some pearls with copic markers for some colorful decorations. The paper comes from two old DSP packs - Christmas Cocoa and Holiday Treasures. I'm trying to use up some old DSP so I've pulled out all my old Christmas paper and that's what I look through first. Have a go at this easy challenge yourself. 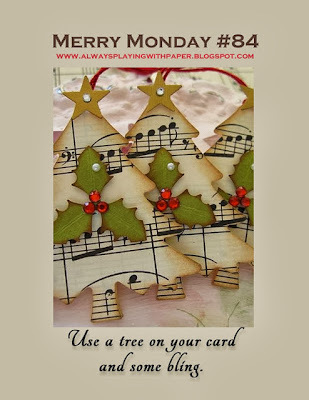 But first, head on over to Merry Monday and check out the rest of the DT cards. I spent the whole of yesterday (in between loads of laundry) making Christmas cards, which I'll post in a couple of weeks. 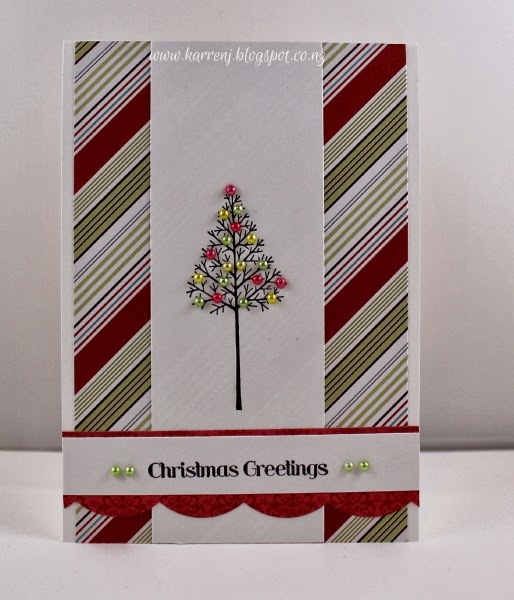 This morning, I thought I'd have a break from Christmas cards and decided to check out the challenges and ended up making, you guessed it, a Christmas card! 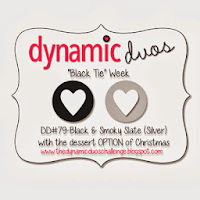 This card is for the sketch challenge at Just Add Ink and the Dynamic Duos challenge. I love circle elements on cards so I had to play along with Just Add Ink this week. 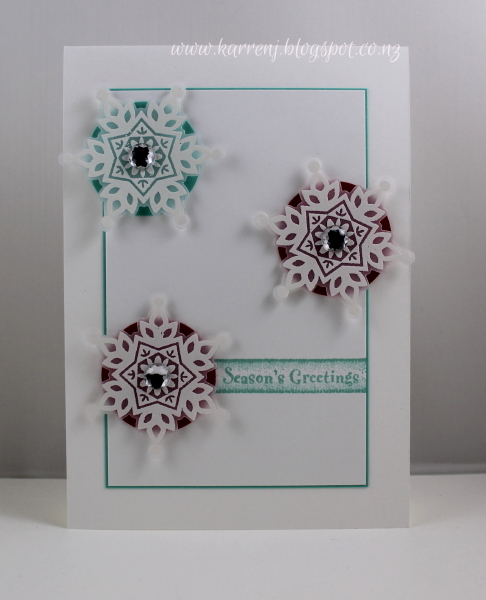 I used a set called Peaceful Season for the sentiment and holly, both of which are silver embossed on black. 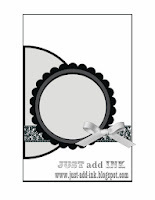 The card base is embossed using the Lacy Brocade EF then spritzed with Silver Smooch Spritz. The DSP is from a Halloween pack called Ghostly Greetings. I had to dust off my Circle Scissor to cut all the circles, which were layered onto Smoky Slate cardstock. I finished off the card with some silver ribbon and one of the Frosted Finishes embellishments. Edited to Add: This card got top honours at Just Add Ink. 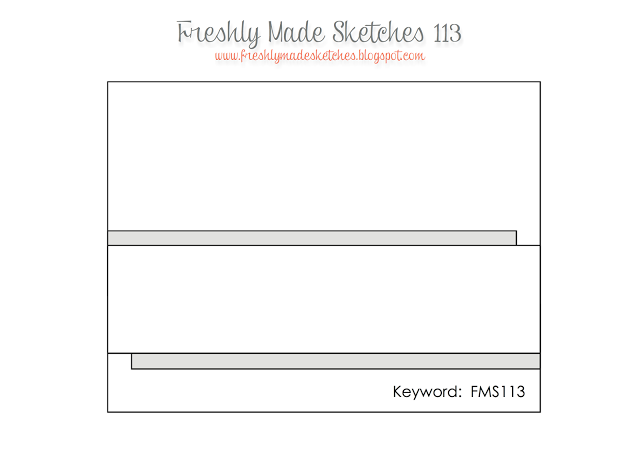 I struggled with this week's Freshly Made Sketch challenge. 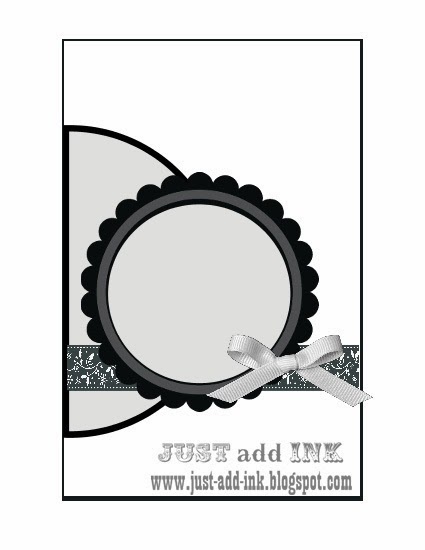 I finally ended up with a card but the ombre sponging creates an annoying effect of making the layers look crooked. Check it out. See what I mean? Those chevrons are on straight, trust me, but they look all crooked. Anyway, there's nothing I can do about it now. 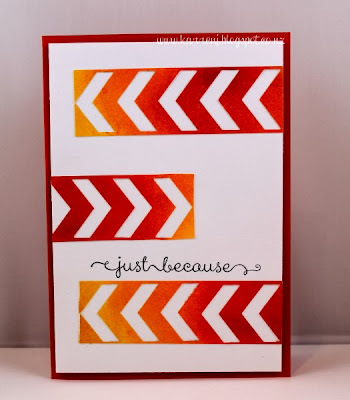 To get the ombre effect, I sponged Crushed Curry, Tangerine Tango and Cajun Craze ink onto Whisper White cardstock. 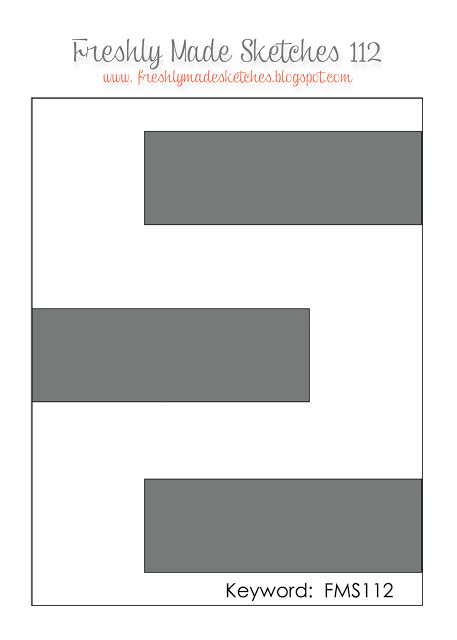 I then punched out chevrons and used the negative punch-out for this card. The Whisper White layer is popped up on dimensionals onto the Tangerine Tango card base. 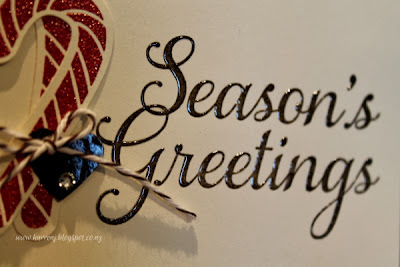 Welcome back for another Merry Monday card. 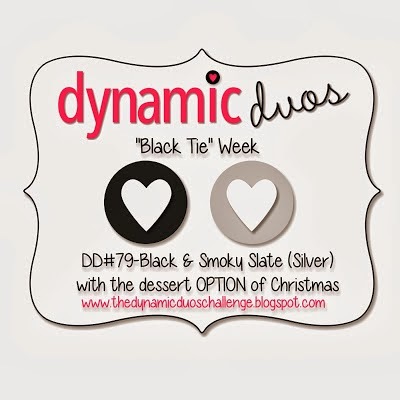 This week we have a cool inspiration photo and a few instructions that can lead you in many different directions. 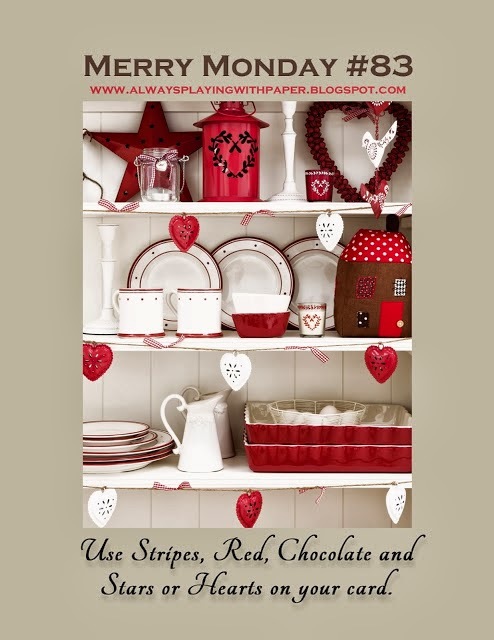 Use stripes, red, chocolate and stars or hearts on your card. While the inspiration photo has a beautiful country feel to it, I went CAS and came up with this card. Take my word for it, this looks so much better IRL! And here's a close-up to show you what I mean. The candy canes are embossed in Cherry Cobbler EP and the sentiment is embossed with Early Espresso ink and Versamark. Even the little heart was punched out of a piece of Early Espresso cardstock that had been clear-embossed. 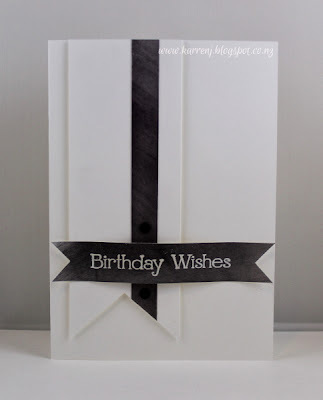 The card based was embossed using the Stylish Stripes Embossing Folder. Check out the inspiration from the rest of the DT and have a go yourself. I'm sure the submissions are going to be really varied this week! It's an overcast Saturday here today and even though it's Spring, it's pretty cool. What better reason to stay inside and stamp?? 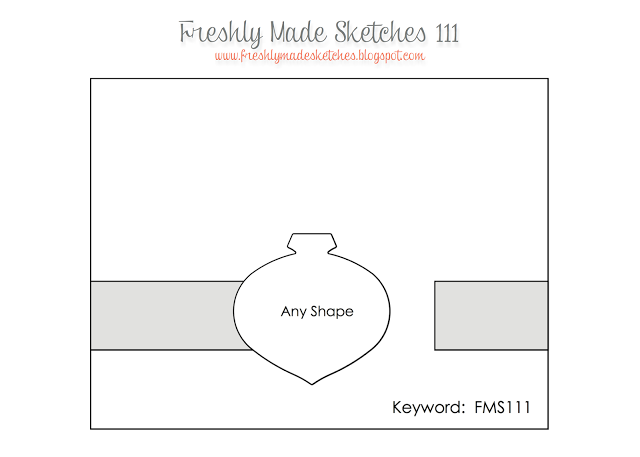 The sketch at Freshly Made Sketches has had me thinking for a couple of days and my original idea was all fancy-schmancy but after wasting a couple of hours on it this morning, I gave up and went simple. My mother is now a CTMH consultant after being left high and dry by Creative Memories, so it's great to discover another new-to-me company's stamps! This set is called Tech Speak and it has some great images, suitable for kids like mine, who would spend all day with a game controller in hand if allowed! 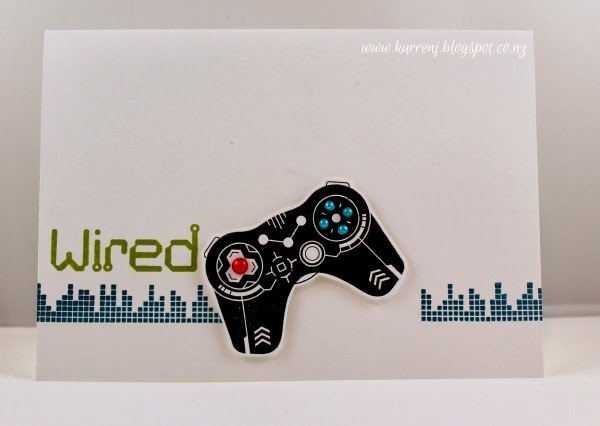 However, I don't know what "wired" means in the US but over here, it means high (and not the vertical kind), so I don't know that I'll actually give this to one of my boys - might send the wrong message! I used my favorite colour combo of Island Indigo and Lucky Limeade for this card. The controller was stamped in black Stazon then cut out and popped up on dimensionals. I colored some Basic Pearls with Sharpie markers to add a bit of interest and dimension. Edited to Add: This card earned a Perfect Princess Award at Freshly Made Sketches. The inspiration photo at Merry Monday is very bright and modern this week. 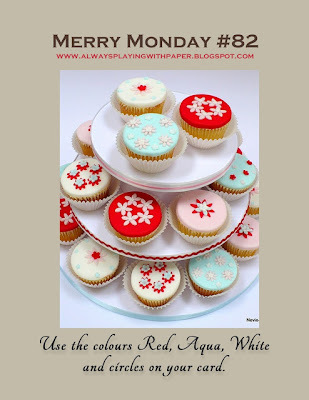 Use the colors red, aqua, white and circles on your card. I had the idea of vellum snowflakes over colored punched circles and a white on white layout. I went with the tiniest Coastal Cabana layer to separate the white layers. The sentiment comes from an old HeroArts boxed set called Holiday Ribbons and really does look like ribbon. I adhered my snowflakes onto the circles with dimensionals then had to cover up the dimensional which is where I got to use the whopping Jumbo Rhinestones for the first time! Go see what the rest of the design team has done with this fantastic inspiration and give it a go yourself. This is my second card today, so if you get notifications via email, please scroll down for my first card. It's been a while since I've been able to play along with CAS(e) This Sketch and CASology so I combined both challenges to come up with this card. I started by sponging a black strip down a piece of white cardstock, but one of my masks let me down, so I had to cut out the black strip and stick it to another piece of white. I only sponged on a diagonal to add some interest. 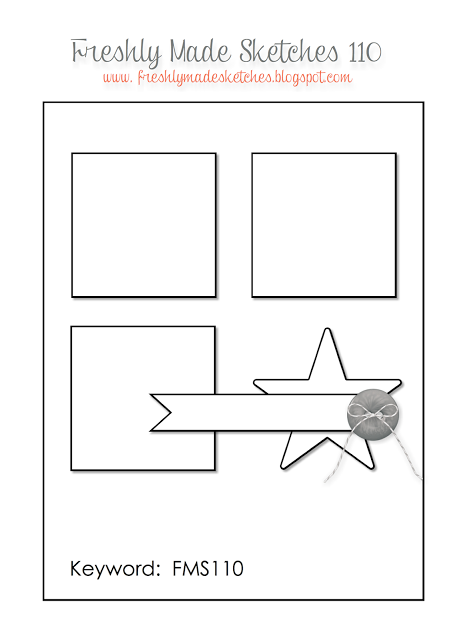 The flag is stuck to the card base using dimensionals. 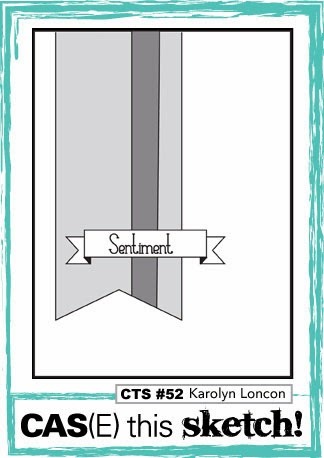 The sentiment flag is a sponged piece with the sentiment white-embossed over the top. 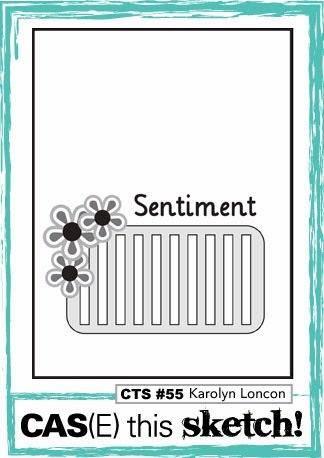 The center of the sentiment flag is popped up on two dimensionals while the outsides are flat to the card - again to give it a bit of dimension. 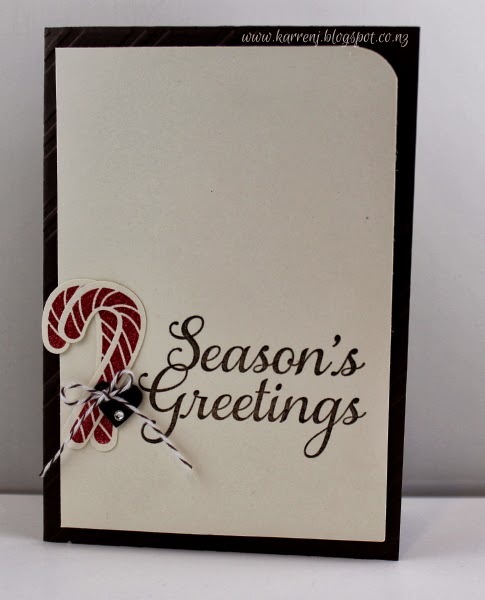 A candy dot above and below the sentiment finished the card. Mother Nature will be rolling her eyes when she sees this card LOL. 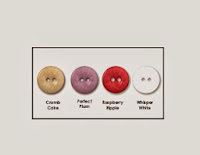 The color challenge at Just Add Ink calls for Raspberry Ripple, Whisper White, Crumb Cake and Perfect Plum. Not a green in sight and I chose to use ginkgo leaves for my card... Go figure! 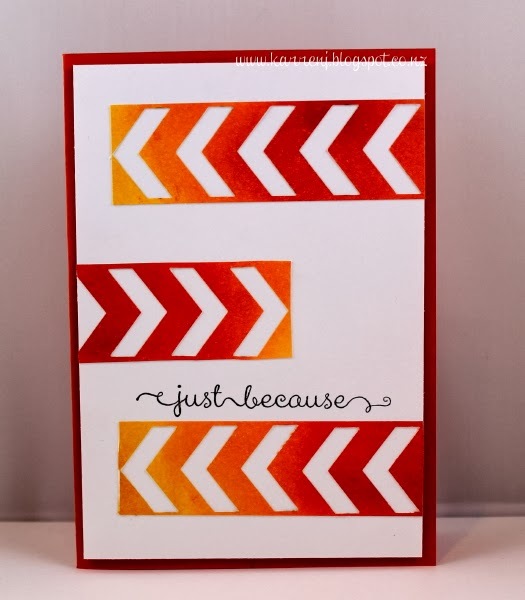 I combined the color challenge with the sketch challenge at Freshly Made Sketches and the Friday Mashup challenge to use chevrons and this is the result. 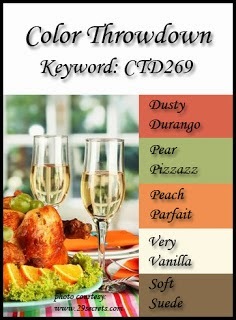 I used the Dictionary background on a Crumb Cake card base and also on some Whisper White squares. For the squares, I bent the stamp so that only a portion of it touched the cardstock. I mounted these squares onto Perfect Plum mats. The focal point caused me some grief! I started out with flowers, then moved onto butterflies, then finally settled on Raspberry Ripple Ginkgo leaves - not very natural I know! 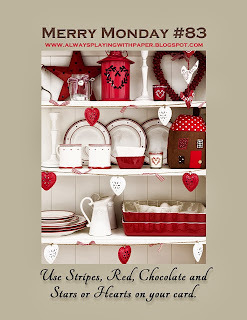 The chevrons are also in Raspberry Ripple and the greeting from On Your Birthday is in Basic Black. 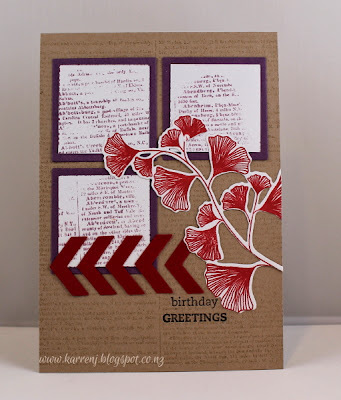 There are no embellishments on this card as I thought there was enough going on!